1. LCD English blue back-light display, voice prompt, ease of use. 2. Support dual-network of both PSTN landline and GSM mobile network, provide redundancy for extra stability. 4. Four sets of scheduled disarmed function. 5. Support configuration via phone ( handset ) or SMS messages to System Setup text messaging costs associated with the alarm panel. 6. 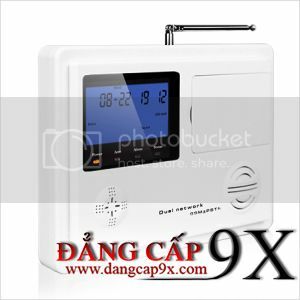 6 group voice alarm phone number for alert calling, 3 group phone number for help senior, 6 group for SMS messaging, numbers saved inside EEPROM without lost upon power failure. 7. Different zones can dial a pre-set telephone number. 8. Support ISD automatic voice mailbox for playback message upon alert. Maximum length of voice message is 10 seconds. 9. Telephone (phone) long-distance telephone control for arming, disarming, monitoring, remote announcement. 10. One set of normally open signal outputs, relay linkage output. 11. Wireless Study Coding, Maximum support 150 remote control and 150 sensors. 12. Unique black box, display recent 72 disarmed records and 102 recent alarm records. 13. Built-in Ni-Hi rechargeable battery and automatically switchable upon power failure. 14. Panel integrated with either dual-band, triple-band, quad-band GSM/GPRS industrial graded module, stable and reliable.